Lactarius caespitosus is fond of wet, low-lying areas at higher elevations in the Rocky Mountains, where it grows under Engelmann spruce and subalpine fir in monsoon season. It is often found growing in fairly tightly packed clusters--which is rare for a Lactarius; Hesler and Smith (1979) named the species for its frequently caespitose growth. Distinguishing features include the sticky, medium-sized, drab brown cap, and the acrid taste. 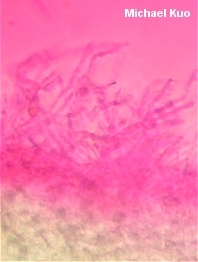 Ecology: Mycorrhizal with conifers--primarily with Engelmann spruce and subalpine fir; growing alone, scattered, gregariously, or fairly frequently in tightly packed clusters, in wet, low-lying areas; late summer and fall; distributed in the Rocky Mountains, the Cascades, and the Sierra Nevada. Cap: 4-15 cm; convex, becoming flattened or shallowly depressed; sticky; bald; dull grayish brown to yellowish brown; without concentric zones of color. Gills: Attached to the stem or beginning to run down it; close or nearly distant; whitish, maturing to pinkish or dirty orangish; bruising slowly brownish. 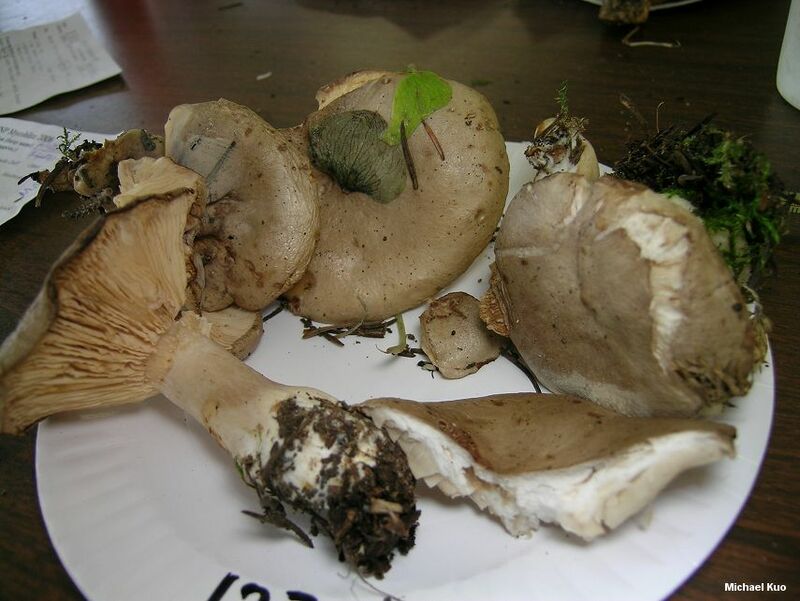 Stem: 2-7 cm long; 1-3 cm thick; more or less equal; sticky when fresh; bald; usually without potholes; white, or becoming colored like the cap; hollowing. Flesh: White; not staining, or staining very slowly yellowish (after a few hours or overnight) when sliced. Milk: White; unchanging on exposure; scanty; staining the flesh very slowly yellowish, and staining the gills slowly brownish. Odor and Taste: Odor fragrant, or not distinctive; taste acrid. Chemical Reactions: KOH dull orange on cap surface. 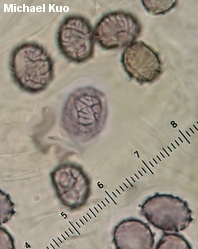 Microscopic Features: Spores 8-12 x 7-9 µ; broadly ellipsoid; ornamentation 0.2-0.5 µ high, as amyloid warts and thin, amyloid lines forming partial reticula. Pleuromacrocystidia abundant; subcylindric to subfusoid; to about 100 x 12 µ. Cheilocystidia similar, or clavate to mucronate; to about 60 µ long. Pileipellis an ixotrichoderm. REFERENCES: Hesler & Smith, 1979. (Smith, Smith & Weber, 1979; Phillips, 1991/2005; Methven, 1997.) Herb. DBG: RMNP 2008-123.